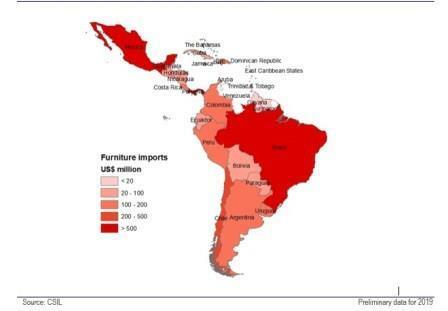 an overview of the furniture industry for 28 countries in Latin America and the Caribbean. Data cover production, consumption, imports, exports for 2014 and consumption forecasts for 2015, 2016 and 2017. .
a focus on the furniture sector in 4 large markets in Latin America: Argentina, Brazil, Chile and Mexico. For each country, the report offers an analysis of the sector performance and market potential, and a brief overview of the competitive system, providing also historical figures for production, exports, imports and consumption. Furthermore short profiles of manufacturers operating in the country are provided. Apparent furniture consumption for 28 countries and by geographical area in 2014 and prospects for the three following years. Furniture imports for 28 countries and by geographical area including a matrix showing the main countries of origin of furniture imports. Furniture production for 28 countries in 2014.
country rankings to place all statistics in a broad Latin American context. South America (12 countries): Argentina, Bolivia, Brazil, Chile, Colombia, Ecuador, Guyana, Paraguay, Peru, Suriname, Uruguay, Venezuela. Central America including Mexico (8 countries): Belize, Costa Rica, El Salvador, Guatemala, Honduras, Mexico, Nicaragua, Panama. The Caribbean (7 countries plus the Eastern Caribbean group of 6 countries): Bahamas, Barbados, Cuba, Dominican Republic, Haiti, Jamaica, Trinidad and Tobago. The Eastern Caribbean countries are Antigua and Barbuda, Dominica, Grenada, Saint Kitts and Nevis, Saint Lucia, Saint Vincent and the Grenadines. - Basic economic data on countries of Latin America and the Caribbean. - Overview of the furniture sector in Latin America and the Caribbean.